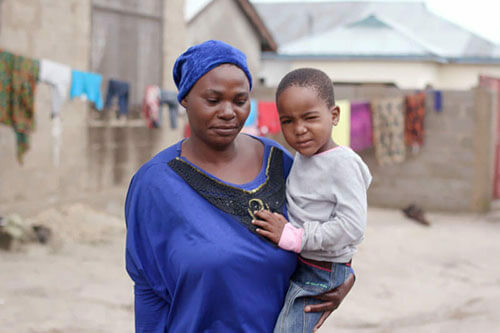 It has taken six months for Shemsa, a single mother, to save up the $15.65 for the two-day train trip to Dar es Salaam, where CCBRT is located. It’s there that I met them for the first time. 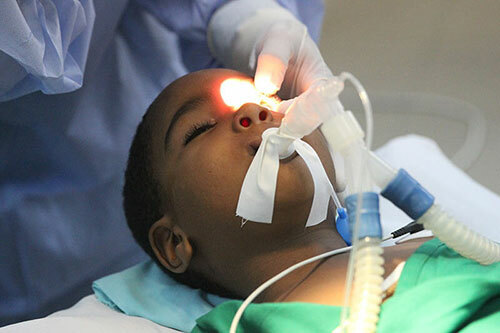 Shemsa’s taken the trip in faith, hoping to get her son admitted for cataract surgery. 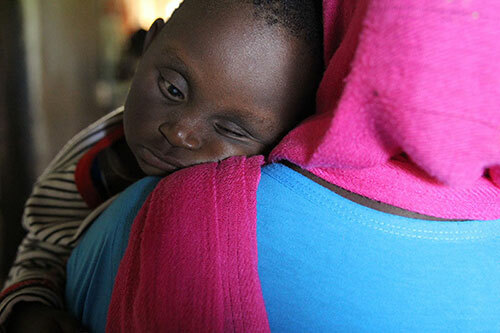 “I worry that my son could be blind for his whole life. That would have taken away his opportunities. Even the school sent him home. Shemsa and Shadhili are lucky, and are able to see a doctor. Dr. Sonia examines the young boy and lets them know that the prognosis is good. Surgery is scheduled for the next day, and it goes well. By the time I see Shadhili again it’s the morning after his surgery and he’s back to his good-natured self, even before the bandages come off his eyes. 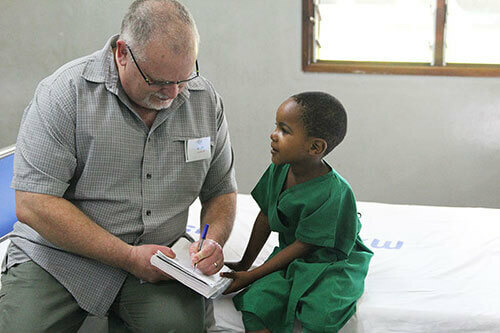 He sits calmly on his mother’s lap as the nurse carefully loosens the tape and pulls off one bandage, then the other. Shadhili looks a tiny bit bewildered. The nurse wipes his eyes with gauze, and then Shadhili begins to smile. Then is smile bubbles into a giggle as he realizes that he can see everything more clearly. In minutes, he jumps down from his mom’s lap and reaches for my hand. I give him a pad of paper and a pen and he draws with me. I draw a fish, and Shadhili giggles and pretends to eat it. He laughs and chatters away with me, reaching up and tapping me on the face with the pen if I’m not giving him enough attention. But my greatest joy was seeing the happiness and relief in Shemsa’s face as she gazed at her son. “I thank you so much for your support”, she says. Her dream for her boy to go to school is now within reach. 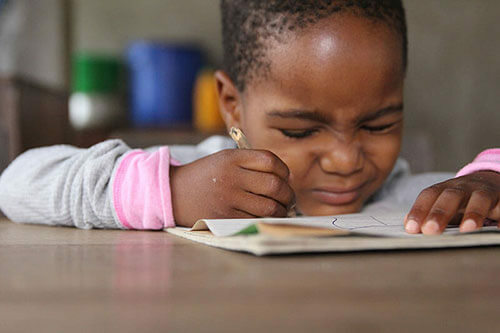 Unable to see, Shadhili struggles to keep up in school. Shadhili and his mother begin the journey to CCBRT, hoping to see a doctor. Shadhili is fortunate. A doctor sees him and he goes into surgery. 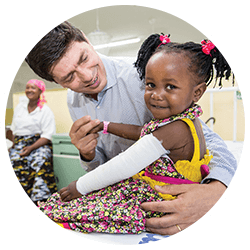 When the bandages are taken off, Shadhili’s face lights up in a smile. He can see! Here he colours with Ed Epp, our executive director. 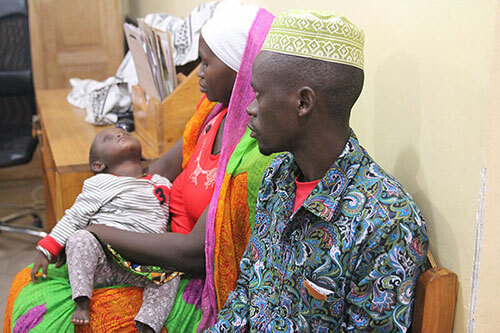 Two-year-old Nasma did not have an easy birth. Due to asphyxia, she has cataracts, cerebral palsy and a possible heart condition. Nasma’s parents thought that their daughter would grow out of the problem with her eyes, and didn’t take her anywhere for treatment. 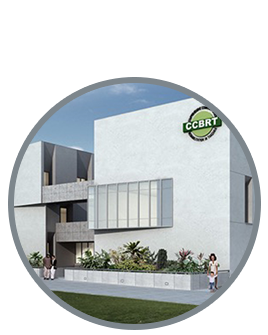 But after a year, they finally took her to the village dispensary which referred them to a district hospital, which in turn referred them to CCBRT. The family lives in a tiny dark room with a curtain for a door, and five other families living in the same small building. Their room is about 8 by 10 feet with one mattress on the floor and a few belongings piled in the corner. 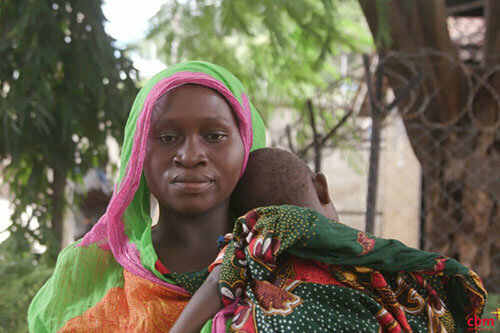 Life is not easy for Nasma and her family, but they remain hopeful and determined to change Nasma’s life. They arrive at CCBRT, dusty and tired after having traveled all through the night. They’re here to see a doctor and desperate to get help. Sadly, Nasma and her family were sent away. There were just too many people to see today and they’ll have to try another time. The disappointment in their faces is hard to witness. 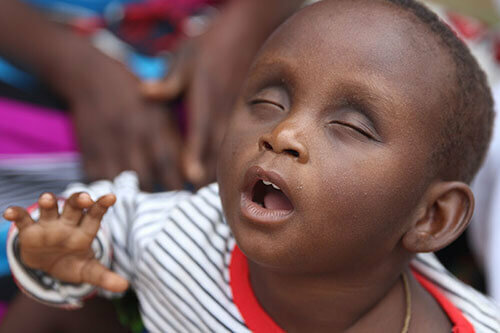 Nasma struggles because she is unable to see. 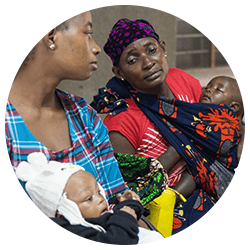 Nasma and her family begin the long and exhausting journey to the hospital. There’s a long wait, but Nasma’s family is hopeful that a doctor will be able to see her. Disappointed, yet determined, Nasma’s mother begins the long journey home. Both Shadhili and Nasma arrived, but only one was seen by a doctor. Sadly, Nasma and her family were sent away. There were just too many people to be seen that day. Nasma will have to try another day. But Shadhili was fortunate. He was admitted for surgery on both his eyes. Two days after walking through the front doors, his bandages were removed and, for the first time in his life, he could see. 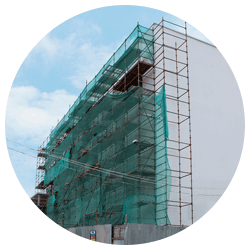 Today and up until December 31, you have a special opportunity to maximize the impact of your contribution. 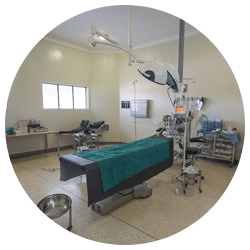 A group of Hope and Healing International supporters are so inspired by the life-changing potential of this project that they’ve offered to match every donation, dollar for dollar, up to $400,700. Your gift today will double to help provide healthy futures for children each and every year.